LIZA AND LIBERACE — Portland-based entertainers David Saffert and Jillian Snow Harris have been making a name for themselves across the nation with a high-voltage, hilarious, and skillful tribute to musical legends Liberace and Liza Minelli. Now, Hillsboro audiences will have the chance to celebrate all the critically-acclaimed charm, warmth, and comedy as Saffert and Harris bring their tribute act to The Vault Theatre for a special one-night only performance, "In Love with Liberace and Liza," on Valentine's Day, Feb. 14. Tickets for this special night of romance, music, and comedy are $50 and include a glass of wine and dessert at intermission, making the evening an ideal option for couples looking for a special occasion to celebrate Valentine's Day. Tickets for "In Love with Liberace and Liza" are on sale at bagnbaggage.org, or can be purchased over the phone at the Bag&Baggage box office at 503-345-9590. THEATER WORKSHOP — Sherwood Center for the Arts Broadway Master Class Series presents "Triple Threat" with Jeff Whiting, Feb. 18 at 4 p.m., Sherwood Center for the Arts, 22689 S.W. Pine St. The event brings top theater professionals to Washington County, working on everything from audition technique and choosing material to the intricacies of acting a song. Both classes will be accompanied by a professional pianist. Parents, directors, teachers, and community members are invited to observe class ($10). This workshop is geared towards intermediate and advanced theater students ages 12 and up. Broadway choreographer and director Jeff Whiting will work with students on all aspects of dancing, acting, singing, and that all-important audition. Starting with a dance workshop patterned after a true Broadway dance call, students will then work on audition technique and song interpretation. Whiting coaches students with detail and care, helping to bring both performance skills and confidence to the next level. $10. For more information, visit sherwoodcenterforthearts.org or 503-625-4278. THE KARATE KID — Sherwood Center for the Arts Family Flix Series presents "The Karate Kid," Feb. 10 at 3 p.m., Sherwood Center for the Arts, 22689 S.W. Pine St., features fun films for the entire family on Sunday afternoons, a great way to introduce kids to your childhood favorites. Daniel finds himself the target of a group of bullies who study karate at the Cobra Kai dojo. Fortunately, Daniel befriends Mr. Miyagi, a repairman who is also a martial arts master. Sweet treats and popcorn will be available for purchase. Doors open at 2:30 p.m. $3 for all ages. For more information, visit sherwoodcenterforthearts.org or 503-625-4278. BREAKFAST AT TIFFANY'S — Sherwood Center for the Arts with its Classic Film Series presents "Breakfast at Tiffany's," on Feb. 28, 7 p.m. Audrey Hepburn plays a Manhattan sophisticate who escorts wealthy men, accepting gifts and money but not their affections. Sweet treats and popcorn will be available for purchase. Doors open at 6:30 p.m. Tickets are $3. For more information, visit sherwoodcenterforthearts.org or 503-625-4278. HANDWRITING — Tigard Public Library hosts "Handwritings of the Presidents," Feb. 12 at 7 p.m. at Tigard Public Library, 13500 S.W. Hall Blvd., Tigard. Certified handwriting analyst Joyce Brizendine examines presidential handwriting from Franklin Roosevelt to Donald Trump and discusses how their writing style reveals unique personality traits. Free. Learn more at tigard-or.gov/library. GRIMM — The Glenn & Viola Walters Cultural Arts Center hosts "Grimm Love" with Anne Rutherford and Norm Brecke, on Feb. 19, 7 p.m., 527 E. Main St., Hillsboro. Gather round for a night of silly and twisted tales of love gone wrong. Inspired by the Brothers Grimm, performed by storytelling duo Anne & Norm, these tales will have you grimm-acing with joy. After the main event, willing audience members will have the opportunity to share their own stories of Grimm Love at an open mic. Stories should be true and under 5 minutes. Recommended for ages 13 and up. Free to the public. To learn more, visit hillsboro-oregon.gov/walters,or call 503-615-3485. ALL THINGS PORTLAND — Tualatin Public Library hosts "100 Things to Do in Portland Before You Die," Feb. 21 at 7 p.m. at Tualatin Public Library, 18878 S.W. Martinazzi Ave. Learn all facets of the city, from the gardens to the shops and the festivals to the bars. Free admission. To learn more, visit tualatinoregon.gov/library. Recommended for ages 18 and up. 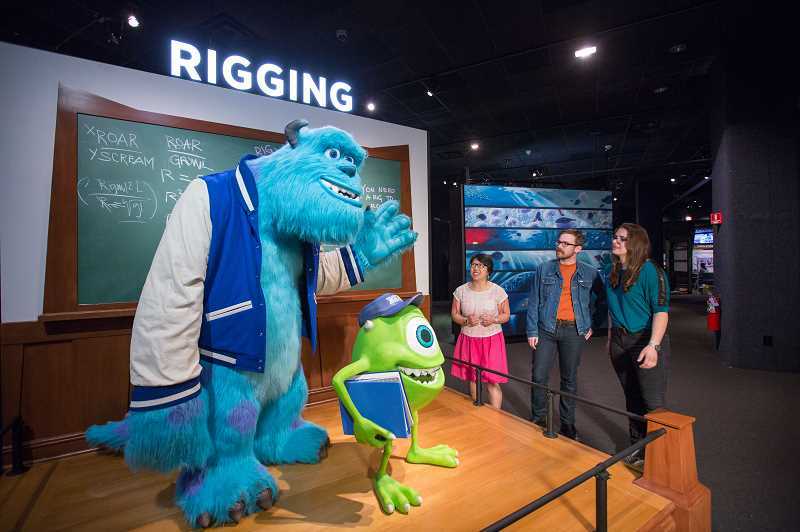 PIXAR AT OMSI — "The Science Behind Pixar," an exhibition about the science behind some of the most beloved animated films and their characters, opens Feb. 23 at the Oregon Museum of Science and Industry. This hands-on exhibition demonstrates the technology that supports the creativity and artistry of Pixar's storytellers. Created by Pixar Animation Studios and the Museum of Science, Boston and featuring more than 40 interactive elements, "The Science Behind Pixar" showcases the science, technology, engineering, art and math concepts used by the artists and computer scientists who help bring Pixar's award-winning films to the big screen. The exhbit runs to Sept. 3. Tickets to this exhibit, which include general museum admission, are $21 for adults, $14 for youth (ages 3-13), and $17 for seniors (ages 63+). Prices for OMSI Members are $5 for adults, $3 for youth, and $4 for seniors. Guests can purchase tickets online at omsi.edu, via phone at 503-797-4000 or in person at the museum. GENEALOGICAL SOCIETY — The Genealogical Society of Washington County Oregon will have its March 2019 meeting on March 9 at the Brookwood Library, 2850 NE Brookwood Parkway, Hillsboro, from 10 a.m. to noon. The speaker will be Dale Deatherage, about "Genealogy and the Law." The meeting is free and open to all. The society encourages genealogical research in Washington County and around the world. For more information, call 503-716-8029. PRUNING — On Saturday, Feb. 16, a pruning demonstration hosted by the Tualatin Valley Garden Club and the Washington County Master Gardeners will take place from 9 a.m. to noon at 3850 S.W. Minter Bridge Road, Hillsboro. Learn from the experts how to properly prune cane berries, grapes, fruit trees, roses, ornamental shrubs and trees. Tool sharpening available. One clean tool per person with name on a label. Please bring pruners and gloves for hands on experience. Hot coffee and cookies available. For more information, call Dave Russell at 503-648-4236 and leave your name and number. ACOUSTIC ARTIST — The Glenn & Viola Walters Cultural Arts Center presents Craig Carothers in concert, Feb. 8 at 7:30 p.m. A Walters' favorite with a loyal Northwest following, Craig Carothers began his career in Portland before relocating to Nashville where he performs his own music at famous stages like the Bluebird Cafe, and writes for artists such as Trisha Yearwood, Kathy Mattea, and Peter, Paul & Mary. His music is heartbreakingly beautiful and scathingly funny, delivered with a lively deadpan smile and a voice that's downright swoony. Discover why his performances over the years have been described as "truly magical," and experience the moving compositions of this home-grown talent with national appeal. Visit craigcarothers.com. Tickets cost $18 advance, $22 day of show. To find out more, visit hillsboro-oregon.gov/walters, 503-615-3485. JAZZ — STAGES Performing Arts Youth Academy presents "Radio Jazz Hour," Feb. 16 at 3 and 7 p.m. at Hillsboro Masonic Lodge, 176 N.E. Second Ave. Step back in time and enter the White Feather Lounge and enjoy the music, comedy and community of the 1940s with performances by some of the best talent in the area. $15 and up. For more information, visit stagesyouth.org. WORLD MUSIC — The Glenn & Viola Walters Cultural Arts Center presents Seffarine in concert, Feb. 22 at 7:30 p.m. at 527 E. Main St., Hillsboro. Sounds including Spanish Flamenco, Arabic, Andalusian, Persian and jazz. Placing in top charts for World Music, Seffarine's international blend of sounds features soulful Moroccan singer Lamiae Naki and flamenco guitarist Nat Hulskamp. Their music embraces and extends Naki's rich heritage, which spans from Moorish Spain to the Sahara, mixing Arabic Andalusi music with the grooves of acclaimed bassist Damian Erskine, the phenomenal chops of Persian master multi-instrumentalist Bobak Salehi, and virtuoso percussionist, Manavihare Fiaindratovo. Seffarine delivers an original and intoxicating sound that Bass Player Magazine describes as a "gorgeous intersection" of Mediterranean and Middle Eastern genres and culture. Learn more at seffarine.com. ABSTRACT PAINTING WORKSHOP — Amy Osborne Art hosts an abstract painting workshop, "Explore the Mysteries of Abstract Painting," Feb. 9, 10:30 a.m., Valley Art Association, 2022 Main St., Forest Grove. Join award winning artists Barbara Martin and Amy Osborne as they find the flow of abstract painting in this fast paced, exciting workshop. Advanced painters as well as beginners will discover new ways of creating dynamic abstract work. This will be a fun and engaging day filled with hands-on exercises and painting time using acrylics. We include breaks for reflection, note-taking and discussion. BAD ART — Tigard Public Library hosts "Very Bad Art," on Feb. 23 at 3 p.m. Tigard Public Library, 13500 S.W. Hall Blvd., Tigard. Not an artist? Great! Join to make whatever kind of art — as long as it is really, really bad. The best bad art piece will win a prize! Free admission. Suggest for adults and teens. Learn more at tigard-or.gov/library. TECH ASSISTANT — Need help with basic computer skills? Drop into the library for regular sessions with local tech assistants on Monday afternoons from 6 to 8 p.m., or call 503-259-0185 to reserve Valley Art Association, 2022 Main St., Forest Grove.